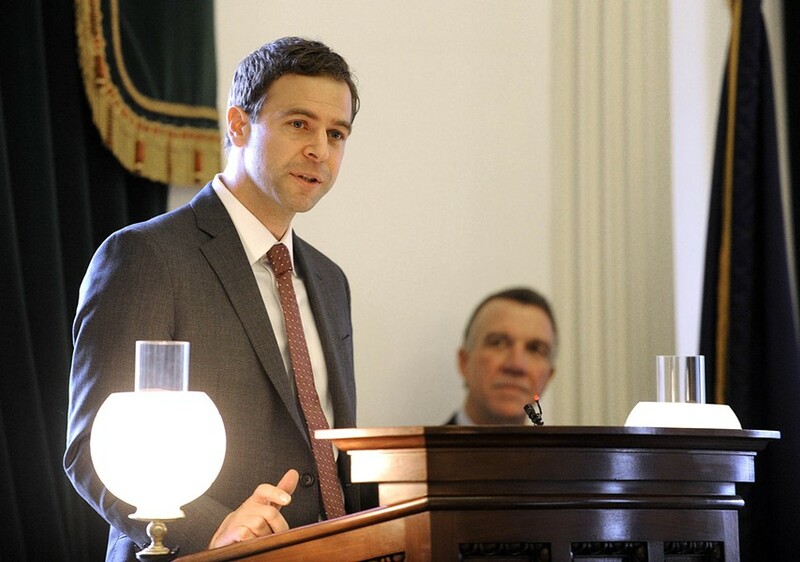 Senate President Pro Tempore Tim Ashe delivers remarks Wednesday on the Senate floor. When Paula Routly and Tim Ashe began dating in 2002, she was the publisher and coeditor of Seven Days and he was a union organizer for United Academics. Nearly 15 years into their relationship, her job title remains the same. His, however, has changed. In 2004, Ashe won his first of three races for the Burlington City Council. Four years later, he won his first of five bids for the Vermont Senate. In 2011, he unsuccessfully sought the Democratic nomination for mayor of Burlington. Throughout Ashe’s political ascent, Seven Days has addressed Routly’s potential conflict of interest in a variety of ways, depending on Ashe’s role at the time. When he ran for mayor, Routly recused herself from assigning and editing stories related to the race — and prepared herself for the possibility that he would run the city her newspaper covered so closely. “I had to ask myself: What if Tim wins?” Routly wrote in a March 2012 story about other so-called “power couples” in Vermont. He didn’t — and she returned to her role managing the Seven Days news team, recusing herself when his name came up and running a one-line disclosure when it appeared in print. On Wednesday morning, Ashe did win — this time a race for president pro tempore of the Vermont Senate. Knowing that he would soon become one of the most powerful politicians in Montpelier, Seven Days set about updating its conflict-of-interest policy last month. We discussed the situation internally and consulted with several outside experts, including Boston Globe managing editor for news Christine Chinlund, Poynter Institute media ethicist Kelly McBride, Northeastern University journalism professor Dan Kennedy and Saint Michael’s College journalism professor David Mindich. The consensus was that Routly ought to recuse herself from involvement with Seven Days’ coverage of the Statehouse and statewide politics. “To date, Tim and I have been able to maintain solid boundaries as they relate to our respective careers,” Routly said, noting that the growing size of Seven Days’ news team has allowed her to step back when necessary. Editors Paul Heintz and Candace Page will manage, edit and assign stories to Seven Days’ state political writers. Routly will not be involved with such stories — and will first see them when they appear online or in print. She will continue to oversee other news beats. The paper will continue to disclose Routly’s and Ashe’s relationship at the end of stories that mention him in any significant way. In its print edition, the paper will add a new, standing disclosure under the masthead. Both disclosures will include a link to a dedicated page providing further information about Seven Days’ policy. The experts we consulted reminded us that relationships between politicians and journalists are nothing new. When Alan Greenspan chaired the Federal Reserve, he was married to NBC News correspondent Andrea Mitchell. When Jay Carney served as White House press secretary, he was married to ABC News correspondent Claire Shipman. And while serving in the U.S. House, Congresswoman Chellie Pingree (D-Maine) was married for a time to Donald Sussman, who held a financial interest in the Portland Press Herald and other major Maine newspapers. While such conflicts may be unavoidable, the experts told us, there are generally accepted practices to mitigate them. Kennedy, who spent a decade covering the media for the late Boston Phoenix, sees the situation similarly. While the experts we consulted largely agreed with our approach — and one another — there were some differences of opinion. Chinlund, for example, thought it prudent to include a standing disclosure under the paper's masthead. But Kennedy thought that would be “excessive,” and McBride warned us against “annoying” our readers with too many disclosures. “Good for you guys, but it could be a bit of overkill,” she said. It might be, but we’re going with it. We hope so, but we recognize that — no matter what policy we put in place — you, our readers, may continue to have questions and concerns about our approach. We hope you will share those with us and let us know how we’re doing. You can reach Paul by emailing paul@sevendaysvt.com and Candace at candace@sevendaysvt.com.